funded faster spending growth through tax-raising measures. €1.7 billion gross fiscal space allowed under rules for 2018 measures. Budget 2018 plans used all of this estimated fiscal space. 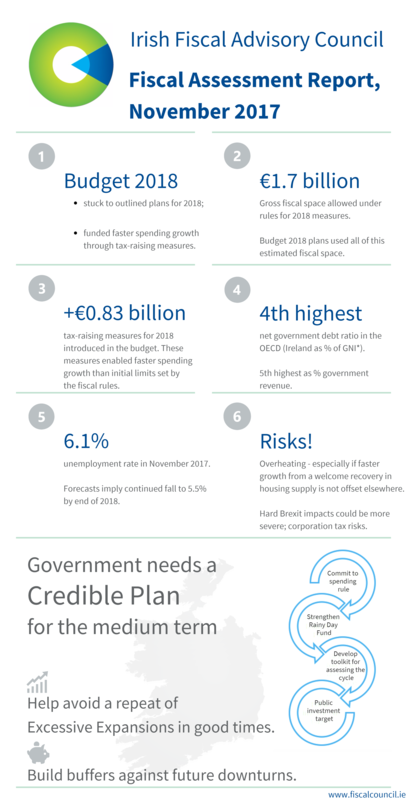 +€0.83 billion tax-raising measures for 2018 introduced in the budget. These measures enabled faster spending growth than initial limits set by the fiscal rules. 4th highest net government debt ratio in the OECD (Ireland as % of GNI*). 5th highest as % government revenue. 6.1% unemployment rate in November 2017. Forecasts imply continued fall to 5.5% by end of 2018. Overheating – especially if faster growth from a welcome recovery in housing supply is not offset elsewhere. Hard Brexit impacts could be more severe; corporation tax risks.
? Help avoid a repeat of Excessive Expansions in good times.
? Build buffers against future downturns.